Aung Sun Suu Kyi is now seen as an enabler of ethnic cleansing and genocide. 3 Oct 2018 – Aung San Suu Kyi, Myanmar’s civilian leader and de facto president, is under fire from all sides. Domestically, she is facing growing criticism for stalled economic and political reforms, glacial progress on policy and service improvements, and the suppression of freedom of expression and press freedom. But it is her international reputation that is most in tatters. The Nobel Peace Prize laureate, imprisoned for 15 years over a 21-year period in her struggle for human rights and democracy, has suffered a swift and dramatic fall from grace as a global icon. She is now widely seen as an enabler of ethnic cleansing and genocide. In just the last few days, Canada stripped Suu Kyi of her honorary citizenship and the Malaysian prime minister stated publicly that she has lost his support. Rarely has the reputation of a leader fallen so far, so fast. Suu Kyi has been the subject of much criticism since taking power 2½ years ago, but the most recent and vociferous condemnation has centred on two events: the jailing of two Reuters journalists who exposed a massacre of Rohingya civilians by the military, and her government’s failure to respond to international investigations into allegations of ethnic cleansing and genocide. 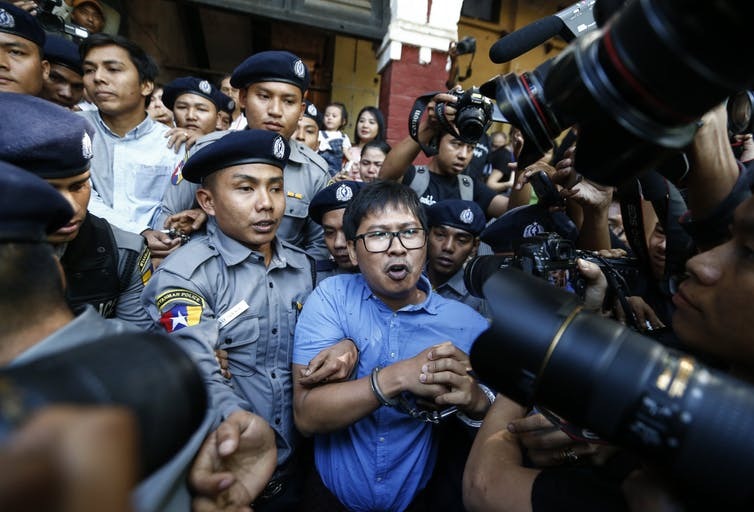 In September, the two Reuters journalists were convicted of possessing official secrets, despite testimony by a policeman that they had been entrapped. It is notable that it was Suu Kyi’s civilian government that prosecuted the journalists, not the military. Suu Kyi could have ordered the charges dropped, as she did for student protesters during her early days in office. Instead, before the trial was over, she commented that the reporters were guilty of violating the Official Secrets Act, and once even allegedly referred to them as “traitors”. The second great disappointment has been the government’s response to the UN Human Rights Council’s report into the violence that drove almost 700,000 Rohingya Muslims to flee to Bangladesh last year. The report, released in full in September, found conclusive evidence that security forces had indeed engaged in mass killings and gang rapes of Rohingya, with genocidal intent. It went on to accuse Suu Kyi and her government of contributing to the atrocities through “acts and omissions”. The HRC recommended the UN Security Council refer the Myanmar commander-in-chief and five generals to the International Criminal Court (ICC). The UN Human Rights Council also set up a body to prepare evidence for trials. Rather than pledge to cooperate with the investigation, however, Suu Kyi has consistently defended the military action against the Rohingya and repeatedly pointed to a lack of understanding of the complexities of the situation. There are, of course, ways in which, with hindsight, we might think that the situation could have been handled better. The military remains a very powerful force in Myanmar. It has the power to appoint its own personnel to a quarter of the seats in parliament and oversees the three powerful ministries of Home Affairs, Defence and Border Affairs. The government has no power to hold the military accountable for actions against the Rohingya. Suu Kyi is therefore in a very weak position. Read more: With a seat on the UN Security Council, what can key ASEAN member Indonesia do to solve the Rohingya crisis? She has nonetheless gone out of her way to not just defend the military, but praise it. In Singapore last month, she made headlines when she declared that the three generals in her cabinet were “rather sweet”. Suu Kyi has stressed that her government’s aim of removing the military from politics would eventually be achieved through negotiation, keeping in mind the need for national reconciliation. However, her dream of constitutional reform depends entirely on military approval. This would appear to inhibit any ability for her to censure the military. She also has no means to compel the military to cooperate with international investigators. Around 700,000 Rohingya refugees have fled from Myanmar to Bangladesh since last year. Suu Kyi still has considerable moral authority within Myanmar, and the military is still widely unpopular. Thus, despite the severe limitations on her power, she does have other options to lead effectively on issues like human rights, the Rohingya and press freedom. Suu Kyi and her government should start by recommitting themselves to a belief in universal human rights. She should also express empathy with the victims of the atrocities in Rakhine state, which may begin to shift popular opinion against the actions of the military and engender more public sympathy for the Rohingya. Further, Suu Kyi needs to pledge full cooperation with the ICC investigation into the serious allegations of ethnic cleansing and genocide, and call for a genuinely independent domestic inquiry to pave the way towards true reconciliation. Suu Kyi may not be able to compel military cooperation with the ICC investigation, or even unfettered access to the country for investigators. But drawing on her moral authority could go a long way to help. She could pave the way for visas and travel approval, for instance, both of which were denied to investigators by her government. Finally, the government must develop robust, urgent repatriation plans for the Rohingya – in cooperation with Bangladesh and the UN – that guarantee their security, human rights, a pathway to full citizenship and an end to segregation in Rakhine. They need a plan for inclusive development policies in the state, and to restore both media freedoms and humanitarian access to the region. The opportunity for such moral leadership is quickly evaporating. Suu Kyi and her government were elected by a landslide in 2015, winning about 80% of seats up for election. Polling released last week showed that only about half those surveyed believe the rights of people have improved in the 2½ years that she has been in power and less than half the population feel there has been any political or economic improvement. There have also been increasing complaints about the performance of the government. With her support eroding both home and abroad, Suu Kyi appears to have a limited window to adequately address the Rohingya crisis and regain her moral authority. 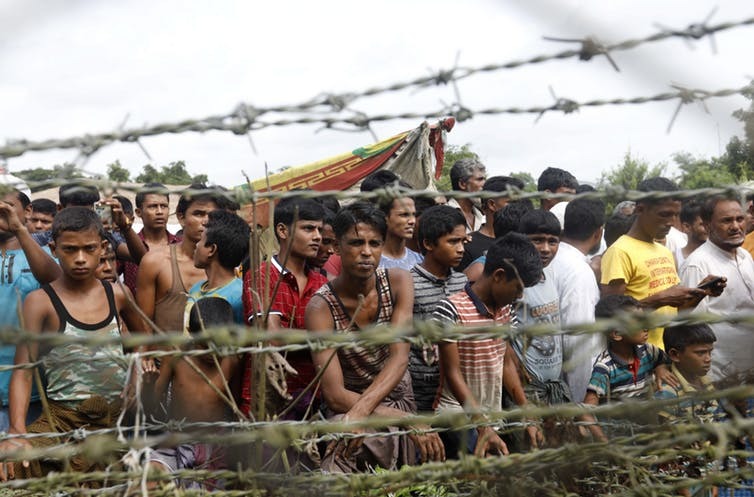 Otherwise, Myanmar risks slipping back into isolation and again becoming a pariah state.